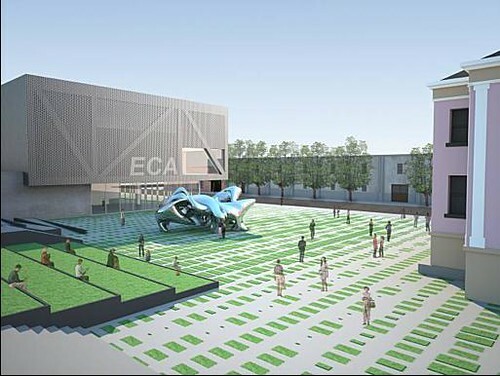 The SF Chronicle’s John King today shares the shortlist for the new Emeryville Center For the Arts. The six contestants are some of the city’s best young firms. In fact organizer David Meckel—stressing this push for emerging talent— initially said that the winner should not be a fellow of the AIA. The finalists include: Aidlin Darling, Edmonds + Lee, Jensen Architects, Ogrydziak Prillinger Architects, Schwartz and Architecture, and Envelope A+D. Their plans are currently on display at Emeryville City Hall, next to which the arts center will eventually sit . All except Edmonds+Lee include the site’s existing 1940’s brick building. Aidlin Darling includes a sloped green roof for film watching; Ogrydziak Prillinger layers spaces in and out of the structure; and Jensen architects opens it up with large, movable glass walls. The winner will be announced next week, so stay tuned.